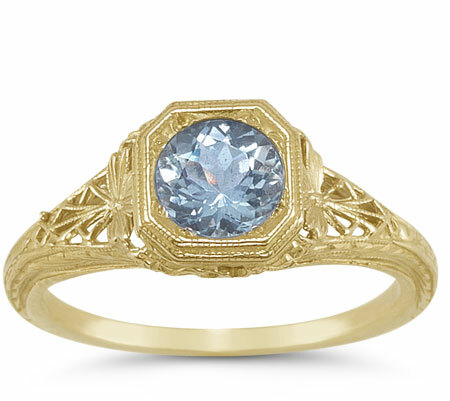 This vintage period lattice design filigree aquamarine ring in 14K yellow gold combines an authentic frosty blue 6mm aquamarine gemstone and an intricately designed ring to create a beautiful combination! Apples of Gold Jewelry has created a unique vintage ring that was made to look just like the original ring from many years ago, and as a historical bonus, the ring was made using the same jewelry making pieces as the originals! The round cut, A rated aquamarine gemstone will shine in this beautiful ring! We guarantee our Vintage Period Lattice Design Filigree Aquamarine Ring in 14K Yellow Gold to be high quality, authentic jewelry, as described above.